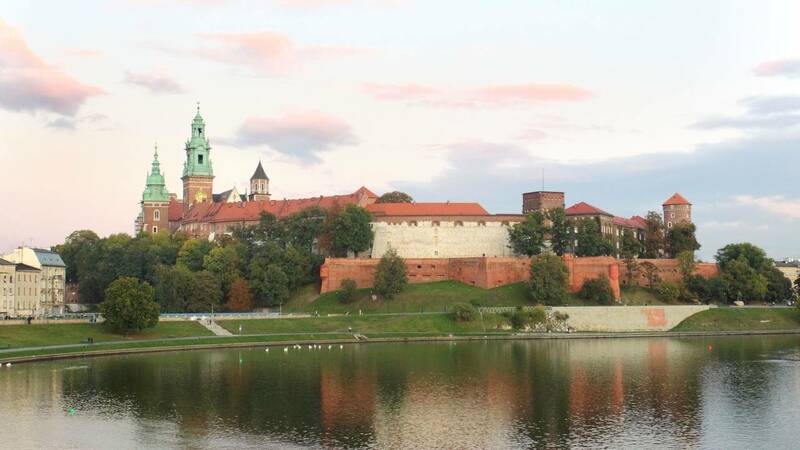 General View of the Royal Castle on the Wawel Hill and Vistula River in Krakow, Poland. (CNN) - Stretching from the amber beaches of the Baltic Sea to the breathtaking peaks of the High Tatra mountains, Poland is as expansive as it is beautiful. The central European nation has an impressive selection of fantastic places any traveler would be happy to discover. With a rich history, welcoming national attitudes, mind-blowingly delicious local cuisine, Poland is a destination ready for exploration. Here are 11 of the most beautiful places to visit in Poland when you travel here. The ancient Polish royal capital is one of the liveliest cities in Europe and is riddled with things to see and do. Kraków's mesmerizing Old Town never fails to impress -- a maze of narrow medieval streets, a kaleidoscope of cozy cafes and bombastic nightlife, plus the superb architecture of St. Mary's Basilica, whose towers offer spectacular views. The city is home to one of Poland's most impressive sights: The grandiose Wawel Castle. Wawel's Italian Renaissance-inspired courtyard is worth the visit alone, but there's also a cathedral with a crypt that's the final resting place for Polish kings, national heroes and revolutionaries. All that and an original Leonardo da Vinci painting -- the lovely "Lady with an Ermine" who sports a smile equally as beguiling as the "Mona Lisa." Poland plus: No visit to Kraków is full without a trip down the wonderful UNESCO-protected Wieliczka Salt Mine. Located in the small city of Wieliczka on the southeastern outskirts of Kraków, this mine is a truly unique engineering marvel, part tribute to the people who carved out its vast caverns and part work of art in its own right. The mine contains the spectacular St. Kinga's underground Chapel and numerous statues entirely made from the rock salt, as well as a thrilling labyrinth of passages and a lake. Also worth a look in is Kraków's Collegium Maius (or "great college" from Latin), the oldest building of the Jagiellonian University. It has a charming 14th-century courtyard and amazing medieval university halls. Walking around the Old Town of Gdańsk evokes feelings of entering a fairytale gingerbread city. There are endless rows of colorful houses and numerous medieval churches, city gates and towers. Nevertheless, Gdańsk is much more. This city's history is filled with dark chapters, having been reduced to rubble during World War II. But also, pride. Post-war, it rose from the ashes, with many old buildings fully restored. Later it became the birthplace of the Solidarity movement that led to the fall of communism in Poland in the 1980s. Today it's a modern port city confidently looking into the future while never forgetting its past. The Museum of the Second World War is a Gdańsk highlight. Occupying an ultra-modern leaning structure that symbolizes a path from the "hell" of war into the bright future of modernity, it sheds light on Gdańsk's and Poland's fate in WWII. Poland plus: Along the coast from Gdańsk is Sopot, Poland's most celebrated seaside resort. Here, magnificent Baltic sea panoramas can be found, particularly on Molo Sopotskie, the longest wooden pier in Europe. The post-socialism industrial town of Łódź (pronounced as "woodzh") is an unlikely contender for a list of Poland's most picturesque spots. It makes the list thanks to a dynamic revitalization process that's turned it into a flourishing center of alternative culture, business and finance. The enormous cotton factories that dot Łódź's cityscape are quickly transforming into galleries, community centers, museums, convention halls and lofts. Even before this started, Łódź possessed one of Poland's most impressive architectural cores, thanks to the spectacular eclectic tenement houses built by the rich industrialists of the past. Among other cool features are the numerous eye-popping murals that can be found all around the downtown. This city is definitely one of the most underrated destinations both of Poland and Europe. To understand why Łódź is nicknamed the alternative culture capital of Poland requires a visit to OFF Piotrkowska, a creative and commercial space in a former cotton mill. This collection of galleries, restaurants, showrooms, concept stores and coffee shops may well be the coolest neighborhood in the country -- if not the continent -- right now. Poland plus: The impressive interior of the Eclectic Poznianski Palace hosting the Museum of the City is awe inspiring. Right next door is the Manufaktura complex -- a living illustration of the successful revitalization process. It's hard to stop admiring the incredible colors of Wrocław's magnificent Gothic Old Town Square. The fourth-biggest city in the country, the capital of Lower Silesia boasts a rich history, welcoming vibes, endless exploration opportunities -- and cute little dwarf statues (called krasnale) that inhabit the streets, doorways, squares and shop entrances. The oldest part of the town, Cathedral Island, is worth a visit, not least for the panoramic views from the top of St. John the Baptist cathedral. Aula Leopoldina, a spectacular well-preserved Baroque hall of the local university, should also be on must-visit lists. Lower Silesia region is a fascinating land of castles and palaces. For fairytale looks, the amazing Czocha Castle -- now a hotel -- ranks highly. WWII mystery fans will also dig Książ Castle, rumored to conceal a Nazi gold train in subterranean tunnels. Poland plus: One of the most stunning natural sights in the country is the naturally formed rock city of Błędne Skały in the Stołowe Mountains National Park southwest of Wrocław. Here visitors can lose themselves wandering around a unique labyrinth of giant rocks and boulders that resemble a scene from a fantasy movie. Instantly recognizable by its trademark red-brick Gothic architecture, Toruń is a gem of Polish tourism and one of the most beautiful destinations in the country. Surviving WWII almost untouched, this UNESCO-protected city has an impressive old town core boasting a mix of Baroque, Gothic and Mannerist buildings. Also, it's the birthplace of Nicolaus Copernicus, an astronomer who changed scientific thinking in the 15th century by deciding the Sun rather than the Earth should be considered the center of the Universe. Toruń is known in Poland as the capital of gingerbread. It's impossible to talk about this city without mentioning baked delights called pierniki, a ginger and cinnamon cookie that's one of the country's favorite sweets. To learn more about the history of gingerbread production in Toruń visit the interactive Museum of Toruń Gingerbread set in the oldest gingerbread factory in Europe. Sugary treats can be burned off by climbing to the top of the Gothic City Hall for views of the oldest part of town. There are more panoramas on the opposite bank of the Vistula river. Poland plus: The biggest Gothic complex in Poland and one of the largest castles in the world is Malbork, a grandiose and mysterious Teutonic stronghold that lies a day trip away from Toruń. This UNESCO-protected ancient medieval masterpiece of engineering impresses with its sheer architectural grandeur. There's no better place in Poland to admire breathtaking vistas than the High Tatra Mountains on the border with Slovakia. The gateway into the natural delights of the Tatras is the small resort city of Zakopane, full of historic wooden villas, plenty of shopping opportunities and access to great ski tracks in winter and numerous hiking trails in summer. Truly magnificent scenery can be appreciated on a tour to Morskie Oko lake -- an Instagrammable landscape to rival Lake Braies in the Dolomites and Hallstatt in the Austrian Alps. The Tatras also has some tasty local cuisine superstars like oscypek (a traditional smoked cheese), kwaśnica (Polish sauerkraut soup) and placek po zbójnicku (a potato cake served in beef sauce). A cable car ride to Kuźnice on the outskirts of Zakopane offers great summit views of Kasprowy Wierch. This mountaintop is an unforgettable natural adventure as well as a great way to experience the High Tatras in a hassle-free way. With eye-pleasing design and a slightly contemporary take on traditional regional dishes, Góralska Tradycja is one of Zakopane's best places to get a taste of local cuisine. Those looking for fairytale castle landscapes in Poland won't be disappointed by Moszna Castle. An Eclectic masterpiece adorned by countless towers and spires, surrounded by gardens and orangeries, this beautiful residence is definitely one of the most striking buildings in Poland. Moszna Castle was originally constructed by the Tiele-Wincklers, a wealthy family of industrialists who influenced its design with their opulent tastes. After World War II, the castle hosted several medical facilities before finally becoming a tourist powerhouse, featuring a hotel and restaurant. A stroll around the fantastic interiors of the castle offers an exciting look at the lifestyle of the aristocracy of the past. Opole, a capital of the surrounding region of the same name, has a picturesque old town and a beautiful riverside panorama of historic houses, nicknamed "Little Venice." Poland plus: Right outside Opole is the attention-worthy Museum of Opole Village, a large open-air exhibition boasting picturesque old wooden houses, windmills and a church relocated from a regional village. It's both fascinating and sad to explore destinations whose description includes the the words "last remaining." Białowieża National Park is one such place. It's a UNESCO-protected wilderness representing a unique European primeval forest. Simply put, it's nature untouched by centuries of human existence. A visit to this area is a thrilling experience, a step back into a world that no longer exists. One of the highlights is the chance to spot bison, a giant animal that's seen as a symbol of Poland. The forest can be visited only accompanied by guide, with tours starting on the outskirts of Białowieża village. A must-see while in Bielowieza National Park is the European bison Show Reserve, a unique semi-natural zoo where visitors can see the legendary bison as well as other animals such as wild boar, wolves and deer that inhabit the surrounding forests. Poland plus: Boasting one of the oldest mosques in Poland, the small village of Kuszyniany is also a unique place to visit. Standing on the border of Belarus, it's a home to the Lipka Tatars who've been living here for centuries. Local Tatarska Jurta restaurant may well be the only place in Poland where it's possible to try authentic Tatar cuisine. If there was a competition to pick the most picturesque Polish small town, Kazimierz Dolny would surely be favorite to win. This town on the banks of the Vistula river is everything you'd expect from a relaxing countryside retreat. It has a beautiful Market Square with well-preserved historic houses in the local Renaissance-Baroque style. Then there are the ancient castle ruins atop the hill above the city, which also provide the best views of the surrounding scenery. Long known as a favorite place to rest among bohemian circles of Polish society, Kazimierz Dolny continues to charm anyone who comes here for a break. To enrich the experience, it's worth sampling the local baked delicacy shaped like a peacock (kogut kazimierski). UNESCO-protected Zamość, not far from the Ukrainian border, is a magnificent example of the Renaissance "ideal town" concept. The centerpiece of the city is the impressive Great Market Square adorned by colorful houses and an imposing town hall. Poland plus: Once nicknamed "Jewish Oxford" for having one of the largest Talmudic schools in Europe, today Lublin is a lively midsize Polish city famous for a beautiful Old Town, superb neo-Gothic castle and a distinct Lublin Renaissance architectural style. Renowned in Poland as the center of business tourism, Poznań is much more than that. One of the oldest cities in Poland, it also frequently tops the country's best living standards chart. The most photogenic spot is the colorful Market Square with rows of painted burgher houses and an impressive Renaissance City Hall that rivals the one in Wrocław in its grandeur. Just like Wrocław, Poznań has its own Cathedral Island dominated by the grandiose St. Peter and Paul's Cathedral. The city also has a great selection of Art Nouveau architecture centered around the hip Jeżyce neighborhood. Poland plus: Poznań is one of Poland's leaders in the food truck scene, offering both quantity and quality. Burger stop Food Patrol is among the best. With a top-notch caffeinated drink proposition, a cozy atmosphere and cool design, Stragan is Poznań's best coffee shop. World War II may have almost completely destroyed Warsaw but this city rose like a true phoenix from the ruins to become one of the most interesting and fastest growing metropolises of Europe. It is hard to believe that the picturesque streets and beautiful buildings of the UNESCO-protected Old Town are a meticulous work of the renovators. Warsaw is inspiring and vibrant, combining the crazy rhythm of the largest business hub of Central Europe with coziness and the welcoming attitude of locals. It's also got a dynamic culinary scene, boasting one of the coolest selections of vegetarian eateries in Europe as well as a great variety of street food spots. Poland plus: Unrivaled views from the top of the giant Stalinist Palace of Science and Culture are worth the climb -- not least because, as locals love to say, it's the only place in the city where the palace itself can't be seen. A glimpse of pre-war Warsaw is on view at the elegant Wilanów palace, which was once the most beautiful architectural jewel of the Polish monarchs. The beautiful symmetrical gardens, adorned with fountains and sculptures of the past, are a relaxing spot.